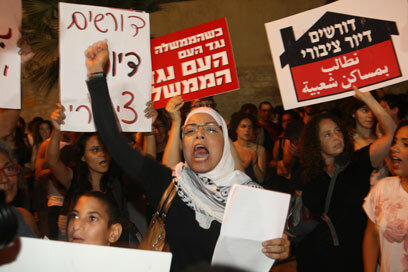 Priphery joins social protest: More than 70,000 people on Saturday evening attended protests against the cost of living and soaring housing prices in the southern city of Beersheba, northern cities of Haifa and Afula and many other cities across the country, according to police estimates. 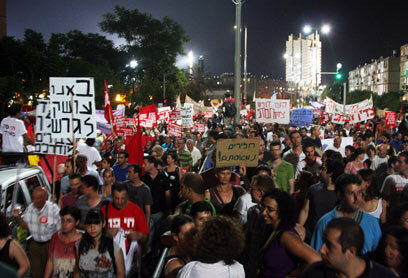 The rallies' participants included the leaders of the Tel Aviv protest city, youth movement members, social activists, worker committees' representatives and famous artists. In Haifa, more than 25,000 Jews and Arabs marched from the Kiryat Eliezer neighborhood to the German Colony, chanting: "We want social justice" and "The government is responsible for the crisis." Some 12,000 protestors gathered in Beersheba and 15,000 in Afula. 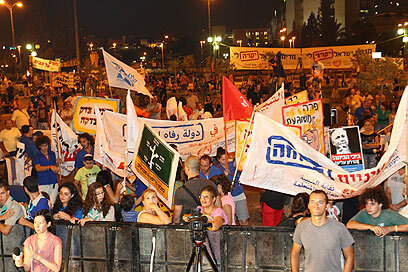 Thousands of people staged smaller rallies in Rosh Pina, Beit Shean, Nazareth, Nahariya, Netanya, Hod Hasharon, Ramat Hasharon, Rishon Lezion, Petah Tikva, Modiin, Beit Shemesh, Ashkelon, Dimona and Eilat. The Arab sector joined the social protest for the first time since it began, although not in masses, with rallies in the cities of Sakhnin, Tayibe and Umm al-Fahm. The National Student Union sent some 50 buses carrying students from academic institutions in central Israel to the different rallies in the southern and northern cities. Uri Keidar, chairman of Ben-Gurion University's Student Union, said during the social protest in Beersheba: "Everyone hears about sleepy citizens, tired youth and detached students. We love this state. We are the salt of the earth, we all woke up and said enough, we want to live in our country in dignity. "Prime Minister Benjamin Netanyahu, your government is not the only government responsible for the situation. But the people work up on your term, and you'll be the one to provide solutions," Keidar said. Sigal Keren, a social activist from Beersheba, slammed the prime minister. "Netanyahu, don't you know what justice means? We're not in America, we're in Israel. I warn you from this stage that if you fail to listen to the people, there'll be huge chaos here, the people will take over and use violence if needed." Itzik Shmuli, chairman of the National Student Union, said during the Afula protest that young people in Israel "have the power to change, to demand a better future. The State has almost given up on us, but we won't give up on the State. The joint goal is starting to bring down the walls between Arabs and Jews, seculars and religious, rightists and leftists. The cost of living has hurt all of us. "We are prepared for a long struggle, but the change is already here," Shmuli added, calling on Netanyahu to "make a social and economic u-turn." Modiin Deputy Mayor Erez Ben-Saadon said, "This is a real struggle. There are no differences between Right and Left here, we're all fighting this war. The social struggle against the State's capitalistic approach must come out of Modiin, which is the capital of the middle class." Kiryat Haim resident Tani Inbar, who took part in the Haifa protest, told Ynet: "Unfortunately, the prime minister is failing to provide solutions to the public. I don’t know what bank managers are getting paid more than NIS 100,000 ($28,000) for. I plan to continue this struggle to the very end." Idan Cohen, a youth movement member from Kiryat Yam, added: "We must be part of this struggle because it's important for our future. Because of the hikes in the prices of food, fuel, electricity and rent, people have to work 24 hours a day. The governments must support our demands rather than ignore them." Singer Achinoam Nini, known worldwide as Noa, said upon arriving to perform in Beersheba: "I think it's a great idea to move the center to the periphery. We are witnessing an amazing civilian awakening and I hope it continues. "Everyone wants to find a balance between freedom of opportunities, economic freedom and prosperity and mutual commitment… This can only take place under conditions of peace, and I believe this word is not mentioned sufficiently." After last week's 300,000-participant protest, the organizers of Tel Aviv's tent city decided to give up on the limelight this Saturday in favor of the periphery. "Today, the fake barriers between Tel Aviv and the rest of the country will finally be broken," Regev Contes, one of the Tel Aviv protest leaders, told Ynet earlier Saturday. "The Tel Aviv bubble, which only existed in the media, is evaporating and making room for a united people of Israel against the only force it is really confronting – the tycoon-backed government," said Contes. "We call on all of Israel's residents to flock to the rally closest to their homes, whether by car or by foot, and to take part in the change we all hope for." Stav Saffir, another Tel Aviv protest leader, said: "Today we are about to do what the State has failed to do since its establishment decades ago, and stop treating the center and the periphery as two different entities with different rights, a different status and different importance in the eyes of the government. "In the past few weeks we have all been working on solidarity and cooperation in 90 different tent cities, and today we shall all march as one across the country and cry out as one united state." See all talkbacks "Over 70,000 protest in Israel's periphery "